A beautifully crafted instrument, designed to inspire innovation. Sublime build quality and sonic attributes. Best suited for a specific playing style. Innovative thinkers are key when it comes to the evolution and development of instrument design, so when word got out that one of Britain’s most prolific musical innovators, Steve Lawson, chose to combine his unique creative talents and insights with those of the Chicago-based luthier Rob Elrick on a new signature instrument, our ears pricked up. Aesthetically, we’re blown away by the timbers here. The combination of a marbled walnut top, macassar ebony fretboard and black Hipshot hardware provides a very clean, enticing and sophisticated appearance. The neck’s narrow 17mm string spacing, plus its particularly shallow D profile - measuring a width of only 2” at the zero fret - and Elrick’s innovative heelless body design all contribute to a sense of refined accessibility. From the oil finish to the impeccably sculptured lower horn, which has been designed to provide support when seated - Lawson’s preferred playing position - the level of consideration given to all aspects of build is impressive. This is the Rolls-Royce of bass guitars. Underneath its beautiful matching wooden covers, the SLC possesses two single-coil custom aero pickups. These deliver stunning clarity and articulation, and the volume-volume-tone control configuration provides a plangent open timbre. This all-passive bass has a vast amount of headroom, which will come in useful when Lawson pushes the signal path through his vast array of effects. At Lawson’s request, Elrick’s semi-hollow, string-through body design also features a pickup selector switch. As it replaces the traditional panoramic pot, and thus removes the ability to graduate the signal source, the feature does enable immediate access to the instrument’s tonal extremes. This complements Lawson’s personal approach to composition, but if you’d rather go another route, Elrick will customise an instrument to your preference. Another Lawson innovation is a killswitch on the front of the body, inspired, he tells us, by the guitarist David Torn. “The feature allows me to perform pronounced rhythmic effects, such as picking a note when the feature is engaged,” said the great man. Flip the killswitch - discreetly located beneath the high C string - with your little finger and you’ll have no end of fun. We relished the ability to cut the signal path, pluck and pre-bend a note, before reinstating the signal and then releasing the pitch in an attempt to replicate some of Dave Gilmour’s signature guitar phrasing. This is a superb instrument with tons of inspiring playability. As a tool to evoke creativity and improvisational art, it’s right up there with the very best. Soloists, chordal players, improvisers and composers will find it an utter joy to interact with. 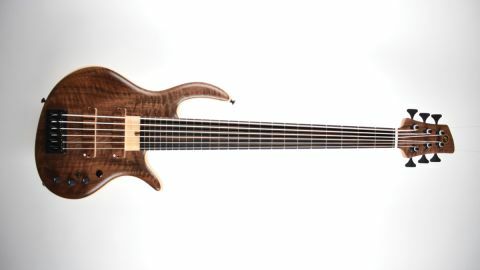 Obviously it’s aimed at a very specific type of innovative bassist, so more traditional players should look elsewhere. It’s super-expensive, too, so consider how well it matches your playing needs - but if it does, you’re in for the playing experience of a lifetime.